To understand the significance of Mt. Rushmore, you must first visit the Rushmore Borglum Story. You will be amazed that Gutzon Borglum excelled in so many fields. Standing in awe of the massive monument of Mt. Rushmore is only the beginning. Venture into the world of the sculptor Gutzon Borglum to dive into the story and further understand the significance of the faces. From the blasting of the stone, to the grandeur of the “Seated Lincoln”, your adventure will walk you through the undertaking Borglum experienced along the way. Our exclusive film narrated by Senator Tom Daschle will take you and Borglum to the top of the monument with a cable car, putting you right into the story. Meet his family, the artists or Mt. Rushmore, and the famous friends. 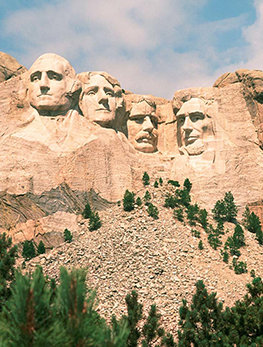 You’ll also get to stand alongside Lincoln’s eye – an exact, full-size replica of the eye placed into the mountain. Let your exploration begin at the Rushmore Borglum Story, and discover what motivated Gutzon Borglum to begin a project that men half his age wouldn’t attempt. Venture into the world of Gutzon Borglum, the sculptor of Mount Rushmore, from the blasting of the stone to the grandeur of the “Seated Lincoln.” On the tour you will meet the artist, his family and the famous people who were his friends.